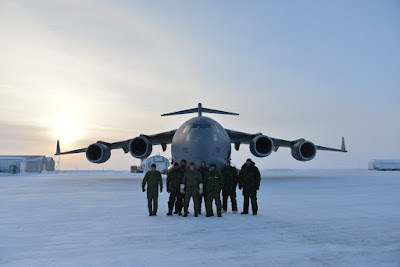 Royal Canadian Air Force aircrew lands the first CC-177 Globemaster in the Arctic region of Hall Beach, Nunavut. Canadian C-17 lands on frozen runway. 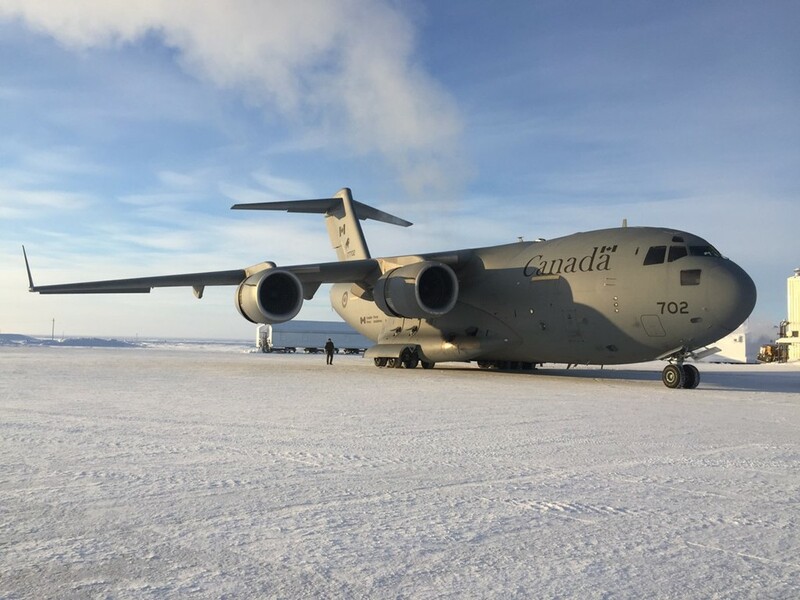 On 11 Feb, 429 Transport Squadron, from 8 Wing Trenton, conducted the first-ever landing in Hall Beach, Nunavut with a CC-177 Globemaster III. Hall Beach is a remote settlement just 69 km south of Igloolik on the shores of the Northwestern Passage. This milestone highlights the reach and capability of the airframe to operate in northern regions on semi-prepared runways; something in which Canada excels. It's not the first time that Canada's CC-177 "Frozen" lands on semi-preparation runway. 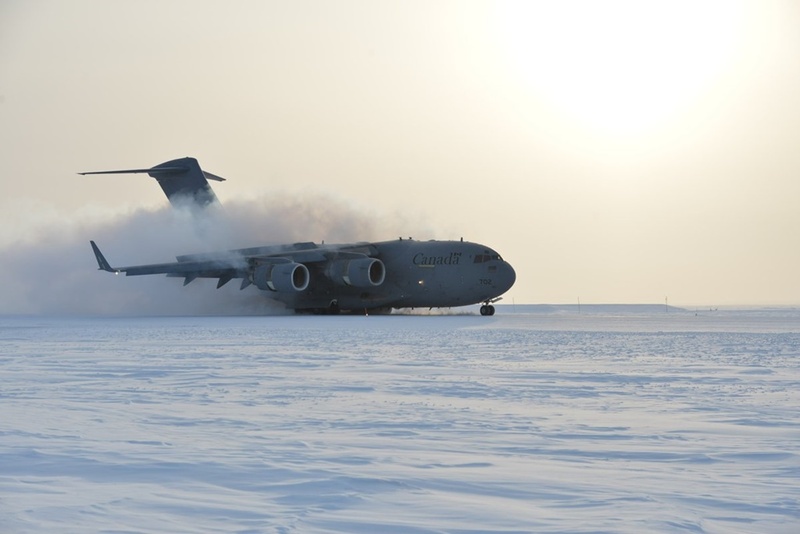 The CC-177 has successfully landed at five Arctic-area unprepared (gravel) landing strips under “frozen runway” conditions. CFS Alert NU, Resolute Bay NU, Cambridge Bay NU, Station Nord Greenland, and as of 11 Feb 2017 Hall Beach NU. 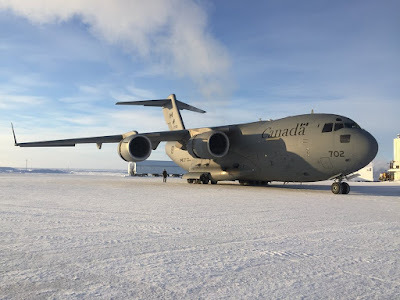 Denmark, aware of Canada’s ability to fly heavy airlift into unprepared Arctic fields, requested Canada’s assistance to resupply Station Nord, Greenland. Canada and the RCAF delivered upon this request, delivering supplies to this remote Arctic airstrip in early 2016. 8 Wing Trenton has been home base to 429 Transport Squadron (TS) since 1990 and has performed a wide range of air transport roles on behalf of Canada - everything from delivering humanitarian aid to disaster zones around the world to ferrying supplies to Canadian troops in Afghanistan. 429 TS has flown a variety of aircraft throughout its history, although the massive CC-177 Globemaster III is the only airframe the squadron flies today. The Royal Canadian Air Force (RCAF) began using the giant airlifter within days of receiving the first Globemaster in the summer of 2007 and crews have been busy ever since delivering on their mission - to develop and maintain a globally responsive capability that enables the Canadian Forces to reliably impact all theatres of operations with relevance and unlimited reach. No wonder 429 TS are proud of their new aircraft and what it can do on behalf of Canada and Canadians - the Globemaster can fly twice as fast and in half the time of the aircraft formerly used by the squadron - the CC-130 Hercules. That translates into delivering people and supplies faster than ever before - wherever and whenever it is needed the most. The scope of this aircraft is unparalleled by any strategic airlifter Canada has ever flown before.